In almost every neighborhood, at least one resident is known for “renting” merchandise from stores. Some refund abusers have purchased ticket guns to reattach price tags to clothing that was only worn once to that party. Some neighbors “rent” tools to use on weekend projects, while others upgrade to the latest technology by refunding last year’s model and then purchasing the newer model. Retailers’ quest for competitiveness and superior customer service has opened the door to retail refund fraud and abuse, not only by consumers who take advantage of retailers’ good will, but also by employees and professional thieves, who sometimes make significant amounts of income from refund schemes. The following actual cases of retail refund fraud and abuse illustrate the types of losses incurred daily by retailers. A loss prevention manager in Des Moines, Iowa, was reviewing the merchandise refund transaction slips for the previous day when he came across a $289 receipted refund transaction involving a lawnmower. He had spent the previous day in an uncomfortable security booth overlooking the refund desk, while observing the activities of a cashier suspected of stealing money from the cash register. He was puzzled by the receipted refund transaction of the lawnmower, because he was certain that he had not seen any customer approach the refund desk area with a lawnmower. The investigation that ensued revealed that the service desk manager was processing high-dollar, receipted customer refunds as no-receipt refund transactions, keeping the receipts, and later using that receipt to process fictitious refunds and pocketing the money. The dishonest employee knew that loss prevention only mailed out refund validation cards on no-receipt refunds and did not pay much attention to receipted refunds. The investigation documented that this employee caused $186,000 loss over a seven-year period. Another loss prevention manager in Denver, Colorado, initiated an investigation of a refund desk employee identified by exception reporting that indicated several irregularities. The investigation revealed that the employee was committing retail refund fraud via a variety of methods, including scanning the bar-coded price tags on merchandise left at the service desk from legitimate customer refunds and the scanning bar-coded sales receipts found in the parking lot or obtained by keeping the customer’s sales receipt and processing the legitimate refund as a no-receipt refund. The investigation evidentially found that this employee had fraudulently “earned” $106,000 over a 14-year period. An enterprising criminal-minded Chicago couple purchased equipment that allowed them to reproduce bar codes as well as print store sales receipts. Their illicit business involved printing the bar code from the $1.99 roll of shelf liner paper on sheets of adhesive-backed labels, taking the labels to the targeted store, and placing the counterfeit bar codes over the bar code on rolls of wallpaper with a retail price of $22.99. They would then purchase fifteen rolls of wallpaper, which would scan on the POS register for $1.99 each for a total of $29.85. They later removed the bogus bar code label and printed a receipt reflecting a purchase of fifteen rolls of wallpaper at $22.99 totaling to $344.85. Using the fraudulent receipt, they would then return to the store to obtain a refund. The couple repeated this process twice a day, 250 days a year, which generated a tax-free income exceeding $150,000 annually. The California Alameda County District Attorney’s office filed criminal charges in 2003 against three illegal Irish immigrants involved in a similar bar code scam. In this case, a bogus bar code was used to significantly reduce the purchase price. The merchandise was later returned with the actual bar code. The refunds were made without sales receipts. These individuals beat the refund tracking system by verbally transposing numbers on the identification, which they read aloud to the refund cashier. These refunds were issued as gift cards, which were then sold at a discounted rate for cash. According to the county newspaper, the police disclosed that $750,000 had been seized from bank accounts in the United States belonging to the three Irish immigrants, and that they had transferred $300,000 to a bank in Ireland on the day they were arrested. In a Detroit, Michigan, drug rehabilitation program group therapy session, a 14- year-old girl related how she became involved with drugs. She explained that when she was unable to score from friends, she would make a trip to nearby retail stores and would simply remove merchandise from the store shelves and take the merchandise directly to the refund registers to obtain the money she needed to buy drugs. She told the group that she has done this frequently for two years and had never been detected or confronted by store employees. In Dallas, Texas, a retail store manager was caught creating bogus merchandise refunds and applying the money as a payment for bank-returned checks. It seems that his district manager had emphatically told him that he had to find a way to reduce bad-check expenses. All of these examples are familiar to loss prevention professionals. But just what is the scope of refund abuse in the overall retail marketplace? To better understand the negative effect of refund fraud on retailers, the consultants at KingRogers International (KRI) conducted a customer returns survey of retail loss prevention professionals in 2003. 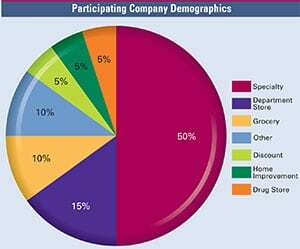 Participants in the survey represented many of the top retail chains and included a good cross representation of the various retail categories, including department, discount, drug, and specialty stores. As with any first-time survey, the KRI team had hoped to get information from more retailers. However, the results of this initial survey provide a valid first look at the subject. The survey found that between 8 and 10 percent of all refunds are attributable to refund fraud or abuse. While refunds as a percent-to-sales ranged from 3 to 29 percent, depending on the type of merchandise the retailer sells, the average for refunds as a percent-to-sales was 7.85 percent. The 2002 National Retail Security Survey conducted by the University of Florida reports an estimated $31.3 billion in shrinkage on retail sales estimated at $1.845 trillion. Applying the survey average of 7.85 percent refunds and the estimated 9 percent fraud to the $1.845 trillion of total sales, an estimated refund fraud total of $13 billion dollars for 2002 can be calculated. Retailers reported that, on average, 80 percent of the refund dollar total was for refunds supported by sales receipts. The remaining 20 percent was for no-receipt refunds. The price of the returned item was not important for a receipted refund, but for non-receipted refunds, 50 percent of the respondents had a policy limiting these returns. These policies ranged from managers’ discretion to department specific to price specific. While some retailers do not honor refund requests without a sales receipt, most retailers that give customer refunds without a receipt generally use a gift card or merchandise credit that must be used in their stores. All of the retailers (excluding military exchanges) that responded to the survey indicated that they did not seek to obtain any identification for refunds with a sales receipt. Ninety percent of those retailers that allowed no-receipt refunds reported that they required government-issued identification prior to issuing a refund for merchandise without a supporting sales receipt. While many of the retailers who responded to this survey used an integrated POS refund authorization system, others relied on store personnel to interpret company policy and make the decision to refuse the refund. 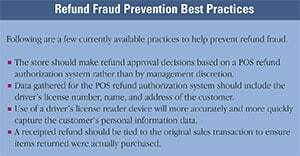 POS refund authorization programs generally use the state driver’s license number to track no-receipt refund activity (80 percent). However, the more sophisticated programs combine the driver’s license number along with the individual’s name and address (73 percent). While many retailers tied the receipt value back to the original purchase total (67 percent), only 33 percent of those surveyed tied the item back to the original receipt. In order to eliminate keying input errors that reduce the effectiveness of their refund tracking program, some retailers reported using reader devices to obtain the encoded personal identification information directly from the state driver’s license bar code or magnetic strip. When it comes to using negative information to identify and stop customers who may be potential refund abusers, the survey results were scattered. Seventy-three percent of those surveyed identified “bad refunders” for no-receipt returns, while only 27 percent tracked receipted returns. Tracking methods ranged from using word-of mouth from stores to database analysis based on driver’s license information and exception reporting. When it comes to stopping customers, the numbers decrease to 50 percent for customers with no receipt, while staying the same at 27 percent for receipted. The survey results indicate that not only do retailers perceive the issue as a significant problem, but the majority stated that reducing fraudulent refunds and refund abuse is a priority for their company in coming years. 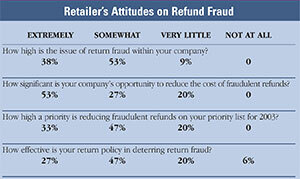 In analyzing the retailers’ perceptions of the problem, it is interesting to note that 80 to 91 percent of the respondents believe that retail refund fraud is an “extremely” or “somewhat” significant issue within their company. At the same time, only 74 percent believe that their return policy was “extremely” or “somewhat” effective in deterring fraud. This indicates that there is certainly room left to improve loss prevention’s response to refund abuse. In fact, a majority of respondents (53 percent) indicated that there was an “extremely” significant opportunity to reduce the cost of fraudulent refunds and, thus, improve their company’s financial performance. There is currently no shared database of refund abuse information similar to those commonly used for check and credit card authorization. Such a database would allow online, real-time compilation of refund transaction information provided by retail members of the database. This type of database uses a rule-based decision model employing a variety of parameters, including, but not limited to, frequency, velocity, and total dollar amount of refunds. The purpose of a shared refund information database would be to use the power of the combined sources of data to more quickly and effectively detect and identify individuals involved in fraudulent or abusive refund activity. This would enable retailers to proactively stop refund fraud instead of each retailer individually having to incur their established number of suspicious refund transactions before being able to defend their profits.